It's Friday! September 30th, 2011 to be exact and here are this week's links and resources shared on Twitter and tagged #practicalmktr grouped here together in Practical Simple Marketing In The News. The Blog Tree: New Growth Includes Simple Marketing Blog! Joy! 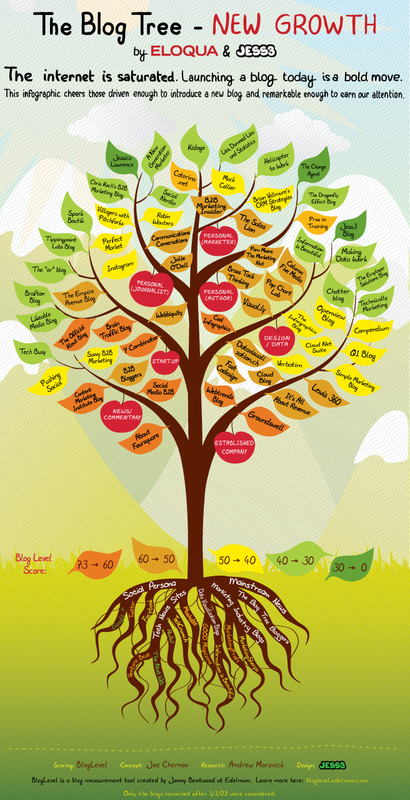 Simple Marketing Blog has been included in a magnificent visualization [aka infographic] titled The Blog Tree: New Growth created by Eloqua, and the brilliant JESS3 about business bloggers. The infographic brilliantly simplifies how the ~70 blogs offer meaning and relate to one another. It's a brilliant combination for discovering fresh resources! I invite you to visit the JESS3 blog article about The Blog Tree: New Growth. It takes you through the various iterations that led to the final Blog Tree visualization. Interestingly, Edelman’sBlogLevel measurement tool was used to identify, evaluate and spotlight "young blogs that stand out in a saturated blogosphere by consistently producing remarkable content." As I learned during a recent demonstration, BlogLevel paints a more holistic picture of influence or remarkableness because it examines frequency of posts, subscribers, SEO value and more, rather than only focusing on traffic and inbound links. "Like its predecessor, the New Growth edition of The Blog Tree explores the relationship between marketing, technology and data visualization bloggers, envisioning blogs as leaves on various branches and rooted by high traffic news and technology blogs. The new tree is made up of about 70 fresh blogs – those that were introduced after January 1, 2009 – to recognize their achievement in earning trust, influence and popularity in a mature and crowded market." 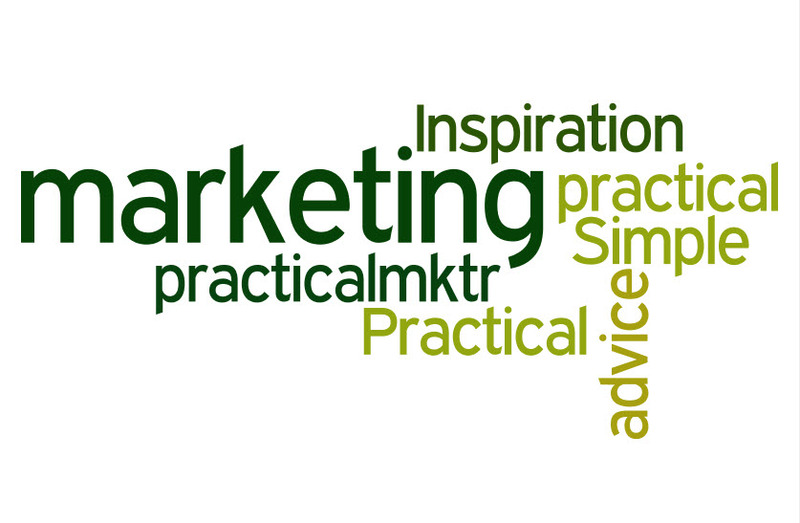 I can't describe how thrilled - and honored - I am that Simple Marketing Blog has been included. At the same time, I'd like to call attention to the other blogs included. They represent brilliance and intense inspiration and include several wonderful online friends, too! By the way, if you would like to have your blog considered for the next iteration of The Blog Tree, visit the Eloqua Facebook Page and tag yourself in the image. You can also follow all of these resources on Twitter via the Blog Tree Twitter List. Here's my official badge! A cross between a leaf and a bird. I'm thrilled to pieces and have already added it to my blog sidebar as well as to the Simple Marketing Now website page about the Simple Marketing Blog. If you'd like to download or embed The Blog Tree, it's available atIt’s All About Revenue today. Enough about me... what's your reaction to The Blog Tree? Do you find it effective for learning about other blog resources? Does it draw you in? For the week ending 9/23/11, here are links and resources shared on Twitter and tagged #practicalmktr grouped here together in Practical Simple Marketing In The News. If you are as intrigued as I am with changing purchase patterns and the role that search plays in the buying process, you will enjoy reading Google's new ebook about ZMOT, Winning the Zero Moment of Truth. I consider the implications profound and recently wrote about them in Inbound Marketing and ZMOT: Perfect Together? The article includes links to the ebook and related resources. Would you let me know your take on the matter? What have you observed in your own behaviors? What about with your customers? How differently are they behaving? These links and resources shared on Twitter and tagged #practicalmktr grouped here together in Practical Simple Marketing In The News - are coming to you directly from Boston! I'm here for some inbound marketing wisdom and to participate in the Hubspot User Group Summit 2011. If you are looking for insights and inspiration on how to improve your business success and profitability, look no further than Business Growth Summit, a free online event featuring leading business strategy experts. It takes place September 12 through 23, 2011. I'm very pleased to be included in this event with a presentation about 'Getting Found Online'. Here's a link to the recent release: Business Marketing Strategies Addressed During Business Growth Summit. Business Growth Summit launched yesterday with a video from Guy Kawasaki, serial entrepreneur and author, whose latest book is Enchantment: The Art of Changing Hearts, Minds, and Actions. You'll find a few more videos featured today, and the rest released Wednesday. Register for the event and experience for yourself the advice Business Growth Summit presenters have to share with you. Then, let me know what resonates the most with you and what you consider most actionable. Here are links and resources for 9/9/11 shared on Twitter and tagged #practicalmktr grouped here together in Practical Simple Marketing In The News. CNET wisdom on growing Facebook Fans and Twitter followers http://ow.ly/6ey1d #practicalmktr it's about engagement! Hot off the press: the just released September 2011 issue of Simple News and Insights from Simple Marketing Now. Won't you check it out? You can access Simple News and Insights by clicking on this link. 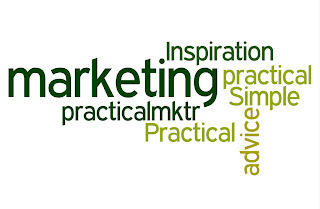 For the first time, I've included an offer to download relevant social media marketing guides. You'll find links to recent articles about content and social media marketing. If you're attending any of the conferences I'm attending, I'd love to connect. Thank you for reading the September 2011 issue of Simple Marketing Now's newsletter. I look forward to hearing your reactions! Are you considering getting deeply immersed in Twitter? If so, and you aren't sure where to start, you might enjoy reading my recent post on Simple Marketing Now's Content Talks Business Blog titled Getting Started with Twitter for Business. 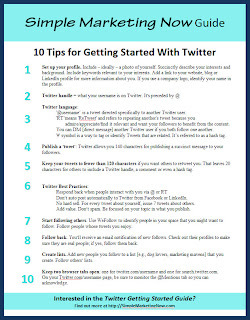 The post details 10 tips for getting started with Twitter and offers access to a guide that goes into more detail on how to use Twitter for business. 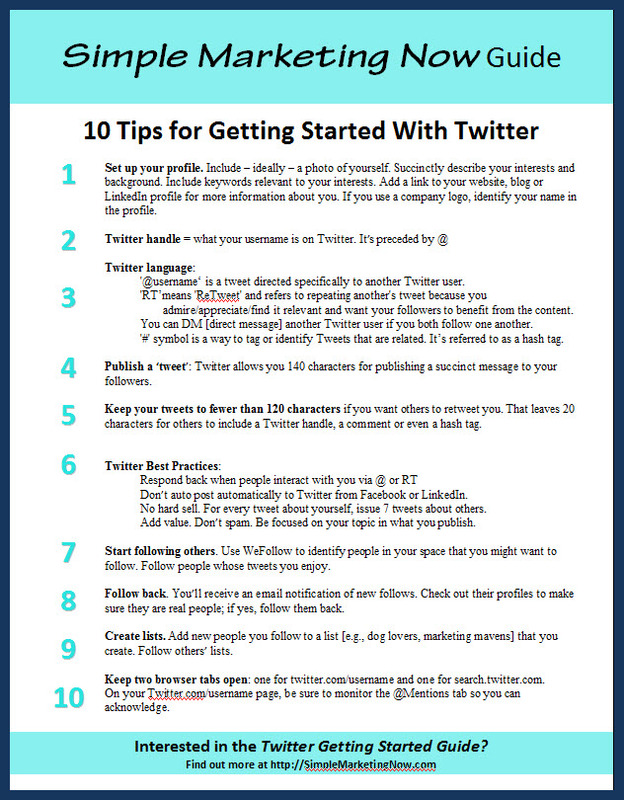 If you are intrigued with Twitter, and looking for some guidance on how to get started, I'd love for you to check the post out and let me know what you think. To access the post, simply click on this link to access my simple Twitter marketing primer tips and guide. Consider this the 9/2/11 post-Irene issue of links and resources shared on Twitter and tagged #practicalmktr grouped here together in Practical Simple Marketing In The News. I hope those of you on the East Cost of the US weathered Irene successfully. We were lucky - see Hurricane Irene in Photos - but are still struggling to maintain dependable Internet connection [very tough for regular blogging :-(]. 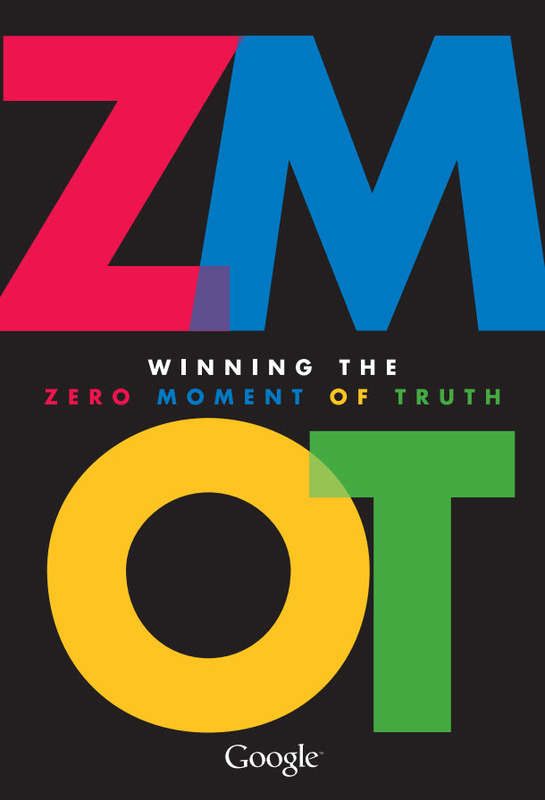 Here's my first post since Irene, titled Inbound Marketing and ZMOT: Perfect Together? I wish you all - even outside the US - a very Happy Labor Day weekend! 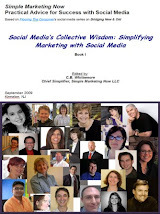 From Social Fresh a crowdsourced Facebook Marketing Book http://ow.ly/6dWxd #practicalmktr Fun!